I realise that many members will not have used this style of web site before and therefore may find getting around the site quite daunting. This is what is known as a "Bulletin Board" style site. Normal web sites do not permit you to interact by adding your own content but you are encouraged to do so here. The more information that members add the more successful the site will become. 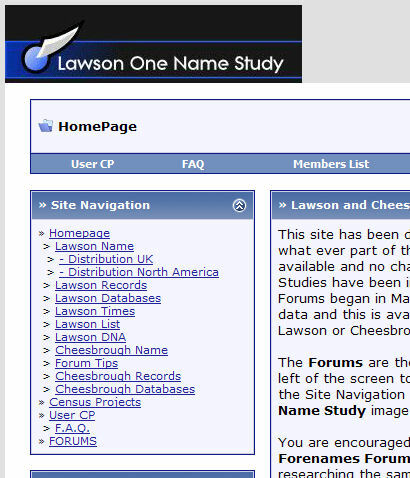 There is an awful lot of data and information held on this site for those researching the surnames Lawson and Cheesbrough. This falls into two main categories, firstly databases which you are welcome to view and secondly Forum Posts which are members own additions about your own specific family. Before you can access the databases you do need to post details of your family in at least one of the various Forums. Above all, the site is secure which means that only authorised members have access to the important parts. That is why you have to sign in and use a User Name and Password. Ticking the 'Remember Me' box at the side of the log in box will mean you do not have to enter your passwords each time you visit. There are several ways in which you can navigate the site. The Blue Banner across the top of this page is the Menu Bar. Simply click on an item with your mouse to take you to that part of the site. This takes you to all sections of the site. The most important section is the FORUMS where you will post details in "Threads" about your family. The FORUMS link is where new posts are made. Simply click on the word FORUMS and another menu appears. You now need to select the Lawson or Cheesbrough Forum that is right for your entry. This is often decided by geographical location of your ancestors. Because the Lawson name is so large it is better to segregate into regions of the world. Therefore simply choose the region appropriate to you. Each sub-section has either Forename (A-Z) or Help Wanted sections so select which is appropriate. Once in the final Forum area select the icon New Thread and a dialogue box will appear for you to enter details about your family. Complete the Subject box with something meaningful such as Joseph Lawson b.1837 Knaresborough, Yorkshire. Then add as much detail as you can in the main box area. Once completed click on the Save button and your post will be added to the Forum. Remember that every single word that you include in your thread will be indexed and is therefore accessible to members through the Search facility. Hence if you perform a search for "Joseph Knaresborough" then every thread or post containing these two names will be found and displayed. If you see a thread or post which interests you and you wish to respond then simply click on the 'Reply' button in that post and add your comments. All posts and threads should be restricted purely to information on Lawson or Cheesbrough families only or other topics of research which can be useful to members in general. Posts should not be purely about other surnames as this would clutter up the site. Most importantly, if you do have any problems navigating the site or you need help or advice on using it then either add a post or write to me personally.